Leading Four Lose 18 Mins. WHEN, in future years, in the hotels and cafés along the 118 miles between Seines and Couvin, they talk of the Tour of Belgium for independents, and note the name of 22-year-old Roger Wyckstandt as the winner of the 1953 race, they will talk of a rider most courageous; of a fighter without a peer; of one who battles with his bicycle and threatens to break it into pieces; but one who, regardless of style, knows where he is going and gets there. Then, their Wyckstandt superlatives exhausted, they will begin to chuckle; and the chuckle will grow into a roar as they recall the great debacle of the Italians on the penultimate day. They will tell of the young touring cyclist who attached himself to the peloton of the aces and ambled with them for five miles whilst Serena (Italian national), Zen (Italian in a Belgian trade team), Assirelli and Ghidini (Italian nationals in command in the team race) and Janssens (the Belgian challenger to the Italian supremacy), played cat and mouse with each other and frittered away their supreme command that had been won the hard way, in the mountains. Fifth man in general classification that morning after a week of heartbreaking punctures, loss of team support from a strength of eight to three, and loss of the Maillot Rose on the fifth day, was Wyckstandt. His arrears were 12 min. 33 sec. His was an impossible task! So the top four let him go with the first break- away and did not worry when the gains at the front became 8 minutes in 40 miles. When it rose to 10 minutes they rallied, but now they were hampered by each other. At 12 minutes the rot set in; now Wyckstandt was a man inspired. 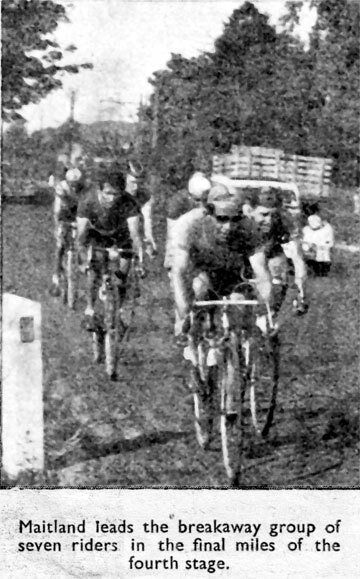 At the front there was a group of 20; it included Britain's remaining four, Bob Maitland, Ian Steel, Gordon Thomas and Bevis Wood. It included Declercq, 36 seconds behind Wyckstandt. Our men were riding _for the day, inspired by the previous day's results. dropped Declercq in the final break of eight riders. Maitland went forward, Wisinsky won the stage by five seconds, Maitland was second again, rising to eighth place in the race as a whole, and Wyckstandt donned the Rose Jersey and rode a lap of honour in the town while the "aces" struggled over the -final miles-18 minutes down! Among them only Zen could smile. While he had gone back his team rider Guldemont had been in the attack and rose to third place while the team took the lead from Italy! Zen was also King of the Mountains winner. A race of fluctuations had turned itself upside down in a few hours and we had played a major part in the upheaval. Wyckstandt did not gamble; he did the only thing possible because he refused to give up when all seemed lost; he showed the qualities of a Tour winner when he set about Declercq instead of relying on his slender advantage. At the end of the day he led by 3 min. 52 sec. When the Tour ended at Alsemberg, near Brussels, on Saturday, it was the same. It was a peculiarity of the race that neither Wyckstandt nor any of the first five. won a stage. The British team was reduced to four when Trevor Fenwick had gear trouble and Ken Russell crashed on the fourth day. Alan Ashmore and Ken Jowett, who was bothered with a bad knee, were recalled, but could not help; they retired. Steel had much trouble that day and only just qualified for the next stage. The team plan then centred on assisting Maitland; in this Steel rendered valuable aid, but after the time trial on Thursday morning it was obvious that it was of no avail. Manager Les Plume then ordered a general team policy; get among the prizes. It was not only the pre-occupation of the leaders that brought success. That situation was to be expected, but there were many others who appreciated this. It needed the highest-grade riding for the aim to succeed. Maitland, at his best, and Steel, battling all the way, really proved their qualities in one of the toughest of road schools, and British road cycling, after groping its inexperienced way through the early pitfalls of stage racing, advanced another step and in this Thomas and Wood played their part as team men. On Thursday Maitland was second and Steel third; on Friday Maitland was again second. This was a five-nation race: Belgians and Italians were dominant, but the British results look very bright against the Dutch failure to finish one rider and France's finishing total of two, Faille (23rd) and Brialy (38th), without a stage placing of note. BEFORE we left Ghent I was assured that it would be a comfortable run to Tirlemont (118 miles) because THE STAGE of the Tour was to follow. Now come with me in the commissaire's car and, after ascertaining (1) that the pace is fast and (2) there is not to be a repetition of the previous day, when a group was allowed to slip the field and gain minutes, we will see what is happening at the rear. Fenwick, we knew, had gear trouble leaving Ghent. Ashmore and Jewett were called back to help him. But Jewett's knee was troubling him and Ashmore could no longer go the pace, so Fenwick chased for miles - but never got back. Meanwhile, Russell's front wheel spindle had broken and he crashed, tried resuming, but was forced to retire. Four British riders behind! Soon it is five. Within 20 miles Steel has gear trouble and a puncture, , The team vehicle is back with the other four; Steel loses many minutes. He begins along, hard ride with a handful of riders, ultimately finishes alone, half an hour down, riding the final 20 miles by himself. It is another fiercely hot day; the roads the worst yet; pave, gravel. grit, dust — no hills but a gruelling course and, our luck of the first three days had gone. Maitland has punctured, Wood stays to help him back The pace is hot, the chase hotter, Maitland and Wood come up so fast that five foreigners with them lose 100 yds. in bridging the last furlong. No food at Malines (40 miles). The vehicle is still behind. Thomas is still with the 80-strong peloton. The attacks grow more vigorous, Lowie (Route de France stage winner) gains two minutes but has no support. Eventually, after 60 miles, there are two groups and in the first, of 19 riders, is Maitland. Two minutes back the second group includes Thomas. To the rear again and Belgian champion Van Vaerenbergh is in distress because of the beat. He is second in the race to team mate Wyckstandt. But not for long. He passes us at 35 m.p.h. and in front of him is a motorcycle! A few words from the commissaire and he joins the growing list of " abandoned." Wyckstandt's team, so dominant after three days, has lost a great personality and the wearer of the race leader's jersey is to suffer further losses on the day ; his, team of seven is down to four by evening! This easy day before the storm! The commissaire is having a field day. Tailed-off riders everywhere are gasping for drinks. Many lonely miles are ahead; they take drinks from anyone, then hear a whisper in their ear "Penalty, two minutes!" Eight riders suffer that way. Fortunately I was able to convince the officials that No. 75 was not No. 7 (Thomas). is negligible. The leaders are being caught! Bob goes forward again, The Italians are on the attack. At Gheel, the second feeding station (80 miles), a new attack has broken out, with Serena (Italy) one of three riders 3/4 minute ahead. At 90 miles there is a chasing group of 22, including Ghidini and Faccioli, of Italy, and Maitland. The pace now is that of early morning; Serena remains in front, alone, at 106 miles and the pursuit is now down to six riders - Maitland, one of them. Seven miles to go, and Serena was caught, but the Italians were happy; Ghidini and Assirelli were there, with Maitland and three others. The pace never slackened; the lead became 1 1/2 minutes. Maitland was going superbly; two punctures, back with the leaders, now for the sprint. He was not to figure in it. Entering Tirlemont his spare tyre fouled his back wheel and the six spurted ahead, Ghidini, ex-amateur world champion, the winner, Stynen, Amelynck and Bronslaer next, Assirelli and Serena five and six, and Maitland, his back wheel dragging, a superb 7th, at 25 seconds, in 4.59.07. Thomas took 5.5.40, and last to finish were Wood. 5.23.11, after doing a grand team job for Maitland and Steel, 5.29.17, no longer with a winning chance after his bad luck, but in time to still be a much-needed team member. 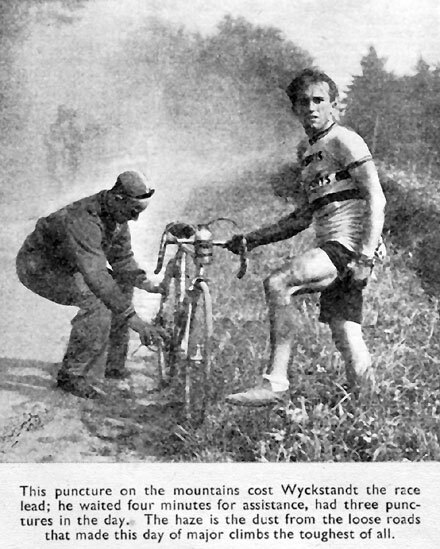 Wyckstandt lost 112 minutes on the day, and Maitland was now only 9 3/4 minutes back on general classification, with Thomas at 33 minutes, Steel at 40 minutes and Wood at 54 minutes. Italy now had Assirelli second, Serena fifth and Ghidini ninth! TIRLEM0NT to Remouchamps. the terrible stage of 108 miles, of seven major hills in the Ardennes, of grit and dust that, thrown up by the accompanying vehicles, blinded the riders, A day of another scorching sun that made this race as tough as they come anywhere. A day of more Italian triumphs; of British disappointment after half-way promise. A day, too, of heartbreaking setbacks for some of the hitherto big names of the Tour. Wyckstandt, race leader, punctured three times, but fought on to within 10 minutes of the stage winner. Ghidini lost 17 minutes.' Serena overcame a puncture to finish Xird at 1 1/2 minutes and take over the race lead. It wasadequate compensation for his great solo effort that just failed on the previous clay. Just ahead of him at Remouchamps was another Italian. Ciolli. And right out in front yet another Italian, Florio Zen, a master among the many mountains, who set the pace, ' survived two tumbles and a terrific mid-race battle with Ciolli and won by 1 min. 34 sec. Zen was riding in a Belgian trade team. He intended it to be his day. At Liege.. with the hills just ahead, he was in a breakaway of three riders 1 1/2 minutes clear of some small groups with Thomas at 2 minutes and Maitland and Steel in the big peloton at 2.50. Then came the first category Fond-des-Cris, the climb that split the field. Zen led by 20 seconds. Thomas, Steel and Maitland were at 2 minutes. This was satisfactory but there was a setback when the British vehicle failed to get through to the feeding station. At 55 miles came the second big climb. the Cote Melchamps. Maitland went forward with six riders. Steel followed with a terrific solo effort. At the front Zen was caught by six riders and Ciolli attacked to lead by a minute. Over the summit a level crossing was closed but the barriers were lifted to let the riders through; Ciolli, Wisinsky, Zen, 12 others, then Maitland and Steel at 1 3/4 minutes, Wood at 3 1/4 and Thomas at 4 1/4. A second category climb at Stavelot and it was Maitland, Steel, Asirelli, Moxhet and Guldemont in a group at 3 minutes with Ciolli and Wisinsky 1 min. 50 sec. clear. Zen crashed and resumed on the Cote de Wanne (75 miles at the summit) he recovered so well that only Ciolli remained in front, and the deficit was down to 40 seconds. Serena punctured here. Steel drew slightly ahead of Maitland but after a 50 m.p.h. descent and dust so thick as to hide the riders, they climbed the Cote de Lavaox together. Ciolli, weakening a little, punctured. Zen, tremendous, raced into a 3/4 minute lead at the top (78 miles), Janssens and Briesen came next; then Ciolli, Serena and eight others at 2 min. Wyckstandt bad punctured and now came with Maitland and Steel at 4 minutes. Thomas and Wood (three punctures on the day) too far back to help out, were coming steadily. But at 85 miles Maitland punctured. After the next big climb his arrears were 7 minutes. Still Zen gained at the front. One more terrible climb, the Cote de Chevron and surface of the poorest, like the toughest British hill-climb. That after 94 miles! The tail-enders walked - could not bother to run. Even the commissaire failed to see the illicit drinks handed up! Maitland punctured again; Steel waited, only to, crash on the descent. Jean Borcy fell and fractured his skull. Crying, he tried to resume, got out of the saddle and punched away. He could not finish. The sting had gone for the British but the early effort still paid dividends. even at a final deficit of 14 minutes Maitland moved up in the general classification. Zen tumbled and ran the last 30 yards of the last climb to lead by 2 min. 40 sec. with Ciolli and Serena together behind him. That was how they finished after the final 12 miles, with the lead down to 1 min. 34 sec., Janssens fourth and De Backer, fifth. Maitland was 27th in 5.21.43; Steel 29th in 5.22.49; Thomas, 47th in 5.36.44; and Wood, 59th in 5.37.53 with 62 finishers inside the time limit and two more so close that they were allowed to remain in. Twenty riders failed to survive that gruelling test and Serena moved up from fourth place on general classification to lead in 25.50.24 with the other positions, previous day in parentheses:—Janssens (6), 25.53.20, 2; Assirelli (2), 25.53.56, 3; Wyckstandt (1), 25.54.37, 4; Zen (19), 25.55.41, 5. Maitland was 14th at 17 min. 32 sec. Steel 41st at 48 min., Thomas 50th and Wood 62nd. Janssens, always thereabouts on previous days and second in general classification after the big mountain stage, was fastest from Remouchamps to Houffalize in 1.40.6 for 42 miles. Serena, race leader, was, with a mighty effort, second in 1.40.37. It preserved his lead by 2 min. 25 sec. from Janssens and now the two were well established on top. Their newest challengers failed against the watch: Assirelli took 1.45.46; Wyckstandt, 1.46.44. Janssens caught them both, at three-minute intervals! It was shock stuff. No excuses for the British four. After a day resting in the little holiday town of Remouchamps they were in good shape, conditions were as they like them. Steel was best, 11th in 1.45.40, reserving a little for the afternoon stage. Thomas was 26th in 1.47.4; Maitland 37th in 1.48,2; Wood 57th in 1.52.53. The first 54 riders started at 2-minute intervals, the last 10, the leaders on classification, at three minutes. Maitland had Ghidini in front of him but the Italian drew ahead all the while and clocked 1.43.59 to finish 7th. Zen, fifth in 1.42.30, moved up to third race place. MAITLAND second and Steel third at Seilles after attacking for most of the 82 miles from Houffalize over roads with one first category and two secondary climbs. Jacques Schoubben was the winner by two lengths from Maitland; Steel was 10 lengths back and the same distance ahead of Arsene Pinoy with Frenchman Faille at 11 seconds and Belgian Blocks at 16 seconds after these six had split on the last severe climb to finish on a plateau. Sound appreciation of the circumstances brought about this grand tonic after a week of fluctuating circumstances. The time trial had proved conclusively that general classification in the race no longer mattered; good showings in the final stages were more valuable than throwing the weight into improving Maitland's position and the teams of Serena, Janssens and Zen would be occupied with each other. So, when Wisinsky attacked on the 7-mile climb out of Houffalize, Steel went after him, and, with Blocks, got clear. Maitland and Thomas joined in a further sortie but Thomas then had his first puncture of the race, when clear of the peloton, with Maitland just ahead. At La Roche, " Pearl of the Ardennes." it was Steel, Wisinsky and Blocks, with Maitland, Faille and four others at 1 min. 20 sec. and the peloton at I min. 40 sec. This was after 15 miles. At Hotten, 25 miles, Maitland was through to the front to join a leading group of eight, that was reduced to six by punctures. They were always in command. Roads were mainly good but for the big climbs it was loose, dusty surface. On this day the luck was with the courageous. Up 700 feet of the second category Cote Gros-Cherie (37 miles), Steel was first, ahead of Maitland, Wisinsky and Piney, with the nearest challengers at 2 1/2 minutes. Wisinsky and Chiti punctured and at the feed (40 miles) the final six were established. On the first category Cote d'Amay (1,200-ft. climb) Pinoy led the way from Blockx, Schoubben, Maitland, Steel and Faille, twelve riders were spread over 4 minutes and the peloton was at 4 1/2! Within two miles came the 600 ft. Cote Ampsin and the stimulating sight of Maitland streaking away to. cross the summit line 12 seconds-70 yards ahead. His speed made it 100 yards just beyond and he seemed to have the others well beaten, 20 miles to go. The situation called for a gamble. Steel was content to sit in. The others were wilting. It was a long run in, but not a hard brae until the last two miles. now playing cat and mouse. Italy had to recover from an early puncture of Assirelli; until then they had been preserving Serena's energies by pushing him up the hills! But when Zen was making his final effort at the front (twice he got clear), it was Serena who led 30 riders in the pursuit and was only 1 min. 51 see. behind the leading group at the line. So it was Serena, 1; Janssens (at 2 min. 24 sec. ), 2,; Zen (at 7 min. 8 sec. ), 3, with Maitland now 14th at 23 min. 5 sec. ; Steel 37th at 46 min. 31 sec. ; Thomas 46 and Wood 59, at the end of the day, which had (apparently) seen the final eclipse of Wyckstandt (two more punctures) and his depleted team. Zen was fined 100 francs for being pushed by his team mates and his relatives were banned from the " caravan " (alternative was disqualification). A. Jacobs was disqualified when he came along at 40 m.p.h. behind a car! MY first note as we began the second- category five-mile climb out of Seilles and saw Wyckstandt and Wisinsky making the pace was: " Wyckstandt will get the Italians moving." I was wrong, but so were the Italian tactics, and Wyckstandt became the man of the day because the Italians did not move. At the hill summit the leading group numbered five, with three small groups chasing. At 15 miles they had joined up and a powerful group of 16 led the peloton by 1 min. 40 sec. Grondelaers had joined Wyckstandt; Maitland, Steel and Thomas were there, and Declerq. Wisinsky had machine trouble and was in a small group, with Wood, between the leaders and the main group. A blow for the Italians: Chili (knee trouble) and Faccioli retired; team was down to four. The front group raced on mercilessly; the Serena, Janssens, Zen group tarried. In 30 miles they lost 7 min. Crazy stuff. Wood's group caught the leaders; we had four in this 20-strong front and mile after mile the gaps grew larger. At the back a young tourist rode with Serena and company! Forward, over fine roads except for the second category Cote Vencimont, where Wisinsky wins again. The feed at 72 miles, then the final break with 35 miles to go. Grondelaers, Wyckstandt, Maitland, 19-year-old Amelynck, Beckaert, Guldemont, Wisinsky, De Backer. Eight quality men. Thomas and Wood fall back; Steel battles but cannot hold the terrific pace on a long hill. Declerq goes; fights for miles at half a minute; then loses two minutes in the last 10 miles. Wyckstandt never allows the pace to flag; Maitland, in the hardest race of his life, goes as well as any in this fantastic break, which sends Wood and Thomas 18 min: back! 'Wisinsky takes his third hill success of the day at Bruly and seizes an opportunity in Couvin to break away as Wyckstandt comes off the front. A gap, too late for the other to close, and he climbs the final hill five seconds ahead of six survivors (De Backer has gone). The final yards and Maitland, the strongest, beat Amelynck by half a length to get second. Now the long wait; six at 3 min. ; Steel just behind, 14th; another group; and 18 1/2 min. later the bedraggled, heartbroken Italians, race lead and team lead gone, with Wyckstandt 3 min. 52 sec. in front of Declerq and 5 min. 58 see, ahead of Guldemont on general classification; Serena now fourth at 6 min. 5 sec., and Maitland, eighth, at 10.42! COUVIN to Alsemberg. 108 miles; triumphant, hot, sunny, miles for Wyckstandt. With heavy-grade tyres to combat the treacherous mid-section of the course, in a trouble-free ride, he never gave his challengers another chance, and there were many easy miles. The greatest pressure came when the Libellula team, had a succession of punctures, and the Libertas team, within two minutes of them in the team race, launched savage attacks to get even. But it was to no avail and all the leading individuals and teams came into Alsemberg in a group, splitting slightly on the hill-climbfinish after the Tour of eight days and 924 miles. Wisinsky sinsky tried for _another win, but punctured when breaking out from a group of four riders, 2 minutes clear, with 12 miles to go. Then, at the front, Ciollo (Italy) fell with Styngen; Jacques Schoubren, who had been chasing for several miles, made a final rally to gain his second win in three days, with Ciolli second. Steel was 9th at 1 min. 1 sec. Maitland 10th at 1 min 4 sec. and Wood and Thomas were at 20 minutes after another unfortunate day of punctures and, for Thomas, a damaged frame during a period of intensive pressure.